Graff is a luxury jewelry brand synonymous with important diamonds. 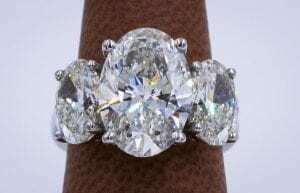 Sell a Graff diamond ring confidently for the best possible cash price. Thought by many to be the heir to Harry Winston, British diamond dealer and retailer Laurence Graff may in fact be the new “King of Diamonds.” His concentration on gem-focused jewelry and large, famous stones has earned him a reputation that puts his house at the forefront of the modern jewelry industry, including the increasingly popular marketplace for pre-owned diamond jewelry. A Graff diamond engagement ring is especially sought-after, regardless if the item is new or previously-owned. Many cost-conscious shoppers actively search out pre-owned engagement rings, especially high-brand rings from elite diamond jewelry brands such as Graff. This enables jewelry buyers such as Diamond Estate to pay the very best prices for a second-hand Graff engagement ring — for we know that the demand for the item will be high, and thus we won’t have to wait months trying to sell the ring via our international resale network. While we purchase most Graff diamond jewelry, we pay premium prices for engagement rings, necklaces, and earrings set with diamonds over 2 carats, including Graff’s popular fancy yellow diamonds. Let us help you get the most money for your Graff diamond ring today. Our estate jewelry experts will gladly answer any question you have about the value of your Graff jewelry and provide you with a free market appraisal. Give us a call or send us a message with a few details about your ring or other item from Graff. Large carat Graff diamond ring recently bought by Diamond Estate. Born near London in 1938, Laurence Graff left school at age 15 to become an apprentice at a jewelry store. While his initial experience of sweeping floors and cleaning toilets didn’t further his career, his perseverance paid off as he eventually learned the trade repairing rings and other pieces. By age 22, Graff had his own small jewelry business in London, but his big break came when he decided to travel to the Far East. In Singapore, he happened to meet the Crown Prince and Princess of Brunei (later the Sultan and Queen), and their patronage led the way for many other elite, ultra-rich clients. Graff’s jewelry business has always been known for handling important diamonds, beginning with the acquisition of the Star of Bombay in 1974. 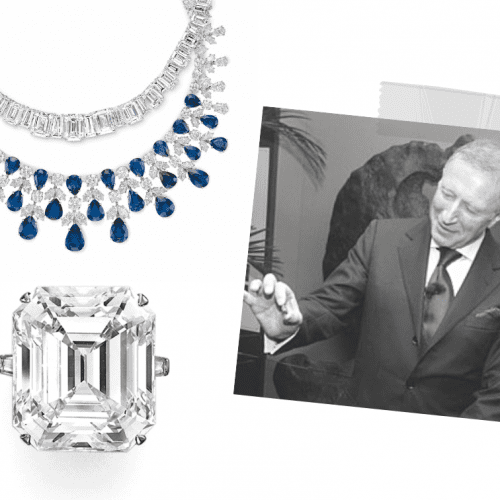 Other famous stones that have passed through Graff’s house include the Grand Coeur d’Afrique, a seventy carat, heart-shaped flawless diamond, and The Empress Rose, a flawless, pink, pear-shaped diamond weighing just under 90 carats. The Wittelsbach diamond, a stone of royalty since 1644, was famously repolished by Graff in 2008. The resulting stone was renamed the Wittlesbach-Graff, the largest internally flawless natural fancy deep blue diamond ever graded by the Gemological Institute of America. Should I Auction My Graff Diamond Ring? If you are thinking about auctioning your Graff diamond ring, either through an online auction or bricks-and-mortar auction, contact Diamond Estate first. There are pros and cons to consider when attempting to auction a large Graff diamond ring — as well as associated auction fees that you may not be familiar with. We will discuss with you all your options for auctioning or selling your item, as well as everything that we know about its value on the estate jewelry marketplace. We provide this information entirely free of charge, regardless of whether you sell your Graff diamond ring to us. We purchase diamond estate jewelry from most Graff collections, including Butterfly, Nuage, Bow, Snowfall, Carissa, Bombé, and Peony.